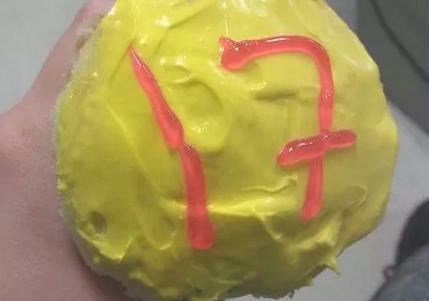 WINCHESTER, Conn. -- Police in Winchester, Connecticut, have charged four teens they say are linked to a batch of cupcakes that were tainted with bodily fluid before being distributed to specific classmates and a teacher in June 2017, reports CBS affiliate WFSB-TV of Hartford, Connecticut. The three former students, and a current student, two of whom are boys and two of whom are girls, have been charged as juveniles. Kelsey Owens, another former student told WFSB-TV the students made two batches of cupcakes and brought them into the Gilbert School, a privately-funded secondary school that operates as Winchester's public middle and high school. The cupcakes allegedly targeting students the suspects didn't like were marked to differentiate them from the rest, Owens said. "The kids I think they didn't like got the ones with dashes through the '7' so they knew those were the tainted ones," Owens said. The former student recalled her friend eating two of the cupcakes. "She didn't feel too well and then she found out that they were tainted, and then she felt violated," Owens said. Police said they did not believe that the substance reported to have been introduced into the batter and/or frosting was toxic or poisonous. No students or staff reported becoming ill as a result of eating the cupcakes. Police said the investigation involved "an extensive forensic examination of the cupcake and DNA comparisons of the suspect juveniles." On Monday, police said the four suspects were charged as juveniles with fourth-degree conspiracy to commit sexual assault, fourth-degree sexual assault, and second-degree breach of peace.